Skin swelling is evident but abdominal angioedema may be a diagnostic challenge. In fact, attacks of abdominal angioedema may mimic surgical emergencies and lead to unnecessary surgeries. C1 protein, showing subunits C1r, C1s, and the C1q tails. 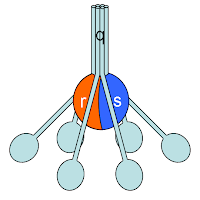 Image source: Wikipedia. Patients with acquired angioedema have low C1q levels AND low C4/C2 levels. In contrast, in hereditary angioedema (HAE) the C1q level is normal. 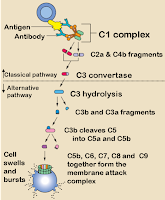 Classical and alternative complement pathways. Image source: Wikipedia. Currently, there no laboratory marker to diagnose angioedema attacks. Prothrombin is produced in the liver. Thrombin is produced by the enzymatic cleavage of two sites on prothrombin. The coagulation cascade. Image source: Wikipedia, GNU Free Documentation License. Plasma F1 + 2 level was higher in patients with C1-INH deficiency during remission and further increased during attacks. Patients without C1-INH deficiency had a normal F1 + 2 level during abdominal colics. Plasma D-dimer level was also higher in patients with C1-INH deficiency during remission and increased during angioedema attacks. The authors concluded that patients with C1-INH deficiency have high prothrombin fragment F1 + 2 and D-dimer levels both at baseline and during attacks. Plasma F1 + 2 was more specific than D-dimer since F1 + 2 level was normal in controls without C1-inhibitor (C1-INH) deficiency. Measurement of F1 + 2 and D-dimer levels may help diagnose acute abdominal attacks in angioedema due to C1-inhibitor deficiency and avoid unnecessary surgery. Plasma biomarkers of acute attacks in patients with angioedema due to C1-inhibitor deficiency. Cugno M, Zanichelli A, Bellatorre AG, Griffini S, Cicardi M. Allergy. 2009 Feb;64(2):254-7. Epub 2008 Dec 4. Asthma is associated with a procoagulant state in the bronchoalveolar space. Blood, 01/2012.